Luxury 2 night stay for 2 people at Mount Falcon incl. dinner, cycling & fishing or golf & spa treats! 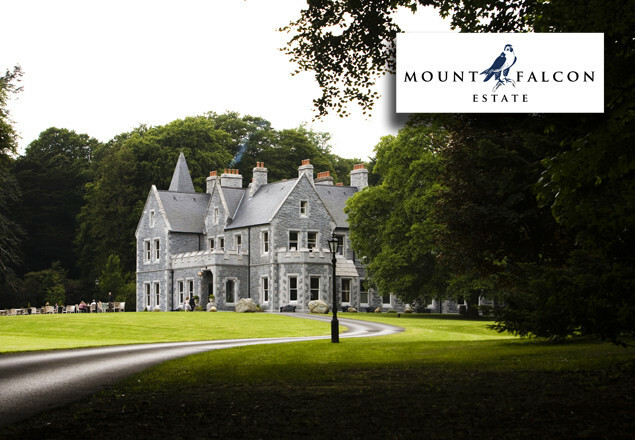 With this exclusive offer from Rewarding Times you get a luxury 2 night stay for two people at Mount Falcon Estate, Mayo including a bistro dinner, cycling and fishing or golf and spa treat! It includes 2 nights bed and breakfast, a glass of Prosecco on arrival, dinner for two from Bistro menu in Boathole Bar, bike hire (1 hour for 2 people), €25 spa credit for every one hours facial or massage booked. Full use of the leisure facilities and 10% discount off all your shopping in Foxford Woolen Mills. You'll be staying in the luxurious four-star Mount Falcon Estate, Manor House Hotel, originally built in 1876, the hotel offers all the amenities and services you'd expect from a modern hotel while maintaining its original, Mayo charm and warmth. Upon check in guests are greeted with a bubbling glass of Prosecco and its time to start making decisions...Should you roam the hotel grounds or try out your swing on their golf driving range, catch a rainbow trout on their estate lake, book your 60 minute spa treatment (using your spa credit) or retreat to your bedroom where the soft and tranquil colours, reflect the beauty of this relaxing and rejuvenating woodland Estate? And don’t forget dinner from The Boathole Bar Bistro Menu. All guests will enjoy full use of the hotel's leisure centre which includes a 17m pool, Jacuzzi, sauna, gym and steam room.